Living carefree at home is the greatest shortcut—- My house is the world’s greatest magic power spot, that being the case both my house and I were summoned to another world by some guys who were aiming for it. However, I’ve been living in this place for many years and my body is, apparently, abnormally overflowing with magic. Due to some unforeseen circumstances by those guys who summoned me, they quickly ran away. Be that as it may, there are some ill-mannered people who covet the magic leaking out of my house. I won’t give up my house to those people! I’m going to wield my power as I please! i honestly can't believe how this got so much 5 stars for others. A perfect example of how a bad writer gets a lot of reads by having an interesting idea. I can accept that I want to read certain cliches from the asian market. Transported to another world, over powered characters, I'm fine with those. It's just the half assed writing that bugs me. First of all, the character comes to the realization that he's in another world way too quickly. He basically wakes up, looks out the window, and he realizes that bizarre fact almost instantly. I don't know about you,... more>> but I'd think that I was kidnapped first. Or that maybe some neighbor installed something weird on his front lawn that I was just too sleepy to see first thing in the morning. Or that I was in another house very similar to my own. Yup, the other reviewer nailed it. This author has a urination fetish.... As of chapter 4 I've read two instances. I'd say this is definitely one of those gimmick series where you just have to ignore the plot and read until you're bored. There is no lasting appeal to this series. If it insterests you, it probably won't for long. Don't read this expecting character or plot. Pure Gimmick. You get what you came for. OP MC with cool fantasy setting, harem with the first girl he sleeps regularly with and doesn't work much for. And an MC too lazy to really deal with the world outside of his house, though if people come to bother him he handles it well. This is the story of the MC's love of the apple tree. Oh how he loves apple trees! He loves planting them. He loves making them grow. He loves eating the apples. He makes apple pie from them. And guess what happens when it's time to fight? That's right. "Go forward my apple trees! Catch my many enemies in your branches! Become apple tree golems for me to fight with. Fire your apple seed gun at them! Let them all perish under the might of my apple trees!" And of... more>> course we get to witness our MC get stronger. At first, he can only make one apple tree golem. But don't fret dear readers. Soon he learns to make 20 apple tree golems at once. Then even 100 at once. He also spends much time carving their faces and making them scary looking. You'll even wet yourself when you see how scary the apple golems are. The other characters certainly did. In fact, just looking at our MC is enough for you to piss yourself. Again and again and again. And of course we can't just leave the piss soiled dirt in front of our precious apple trees. No. We must scoop it up and dispose of it like kitty litter. Now you might think the MC would run out of apple tree related things to do. Hah! I haven't even told you about the golden apple yet. Or the storehouse he builds to hold the apples. Or the room he stores all the wood from the apple trees. Or about apple golem storage room. The saddest part was when a dragon attacked and charred a whole room filled with apple golems. I wept apple juice tears when that happened. Sometimes our MC even goes into battle himself with his special apple tree armor. If you want to waste away a little time with some comedic story with a super OP MC from another world, this is it. Chapters are relatively short and the story just keeps getting funnier and funnier as the story goes on. Also, I find myself rolling on the floor crying from laughter from the misunderstandings that not only the MC has, but also the side characters. My favorite part of the plot so far is the fact that the house spirit, Sakura, spent too much magic in renovating the land and to regain that magic quick enough to survive, she has to "fulfill her desires." Put it short, the house ran out of magic and the MC had s*x with the house to make it regain magic faster.... YEP! Best part is, the house got pregnant and their child.... WAS A SECOND LAYER FOR THE HOUSE! That's right, the dude's kid is a second floor for his house. -Chapters are as long as ONE action takes. e.g. "Protagonist takes a piss in 500 words. Chapter ends." e.g. "Cleaning someone that pissed themselves." -No character development of any kind. -OP character for the sake of being OP, no relevance to story. -Really bad slice of life. - No direction, just the story of a aimless shut in NEET hikikomori staying home. If there's even one reason you dislike JP stories, you'll bore yourself to death with this. So cliche it hurts, lazy protagonist that's only worldly desire is to sleep all the time, falls into an urine soaked fantasy world where his only skill is to yell at people until they piss themselves. However, since the MC sleeps all the time and has no other characteristics, motivations, plot, desires or thought other than sleeping and eating. The author decides to turn his house into an anime spirit wife who acts like a mother/bang maid to fulfill every one of the MC's desires and needs. Solid slice of life story about OP MC who's super lazy and sleeps all day with his pseudo harem. Basically tasty junk food. Slow releases so don't expect too much. A slice of life novel with short chapters that are easy to read and don't have confusing tense changes in weird places. The content is slow as per the norm for a slice of life, the main character starts off funny but becomes slightly dull very quickly as my interest was more focused on the reactions of the side characters. Daichi (MC) : I'll do something boring. person: I have a crush on Daichi but I won't do anything about it. I keep reading this because I'm human scum but you should only read this to waste time. Don't expect anything deep hidden in the plot. It's a simple and fun slice-of-life story about an overpowered guy just trying to live his everyday life with his beloved house and apple trees whilst getting involved with various "strong" people and creatures in that world. He'll literally win all the fights quite easily so don't expect any hardships here. If you want to take a break and read something fun and light-hearted with none of those dark plots, then you should check this out. I can't really say much more about this novel than meh. It has promising settup but execution is overall poor. Characters are boring and don't have any depht in them nor are they growing during the story. Plot itself too is nonexistent and story doesn't move in any meaningfull direction staying as MC being lazy dunce and getting more and more female tag-alongs. Basicly this novel is just boring slice of life at its best, so I don't recomend this for anyone to read. Good read, but right now I can't see a single plot. I hope the MC will not stay forever in his house or atleast author give some immediate goals, right now MC just sleeps, eats, etc in his house. Well, just like others say, it is indeed pretty bland. It's a lighthearted comedy where the gags just doesn't pull through most of the time. Girls wetting themselves are a running "joke" throughout the novel, because of the MCs incredible powers, almost all of them wet themselves once or twice while the princess probably has the record for wetting herself probably over a dozen times. He has no motivation to go anywhere or do anything, he just lazes around at home most of the time and goes to the town now and then. Yeah... I don't really know what else to write. Nothing is ever really explained in the novel. It wasn't that interesting, but I still give it a 3.5/5 in score because it managed to interest me a bit and I feel like a lot of people are giving this too low scores just because they didn't know what they were getting into. The story goes nowhere, the characters are very 2 dimensional, and there is not a single real antagonist that does anything. Everything is also solved in one short chapter and yet the story still goes on. The protagonist doesn't even care about 100% of anything important and everything is very chaotic yet peacefull. The only reason I'm still reading it is that it doesn't 100% bore me. This is a nice happy, casual, and heartwarming story similar to Death march, and that is one of the things I love about it. 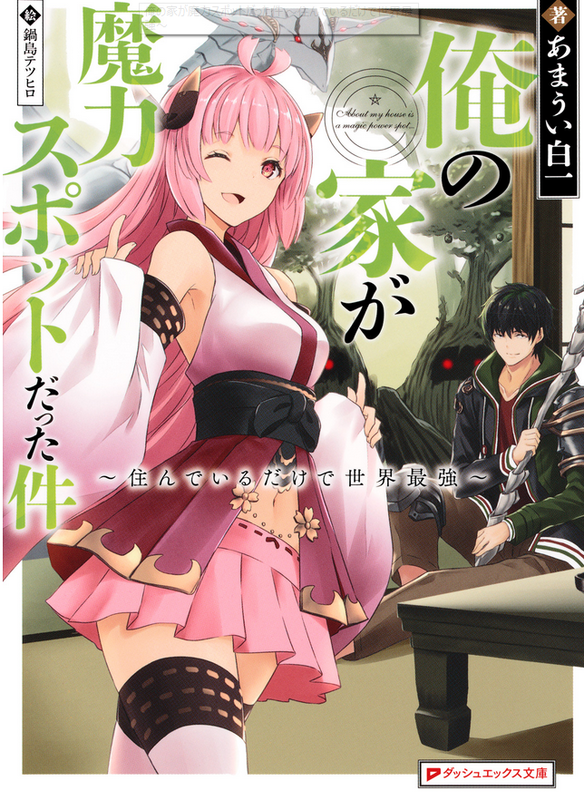 Similar to Satou our protagonist experiments with what he can do with his magic power, lives in his house with... his house (the pink haired girl in the picture) Her name is Sakura (hope that isn't considered a spoiler! I mean, she is in the picture, she gets revealed in the first chapter and all.) Its a really laid back story really, and that's good.